This title presents winning student speeches to the United Nations on the UN's Millennium Development Goals. At the 2000 UN Millennium Summit, world leaders from rich and poor countries alike committed themselves - at the highest political level - to a set of eight time-bound targets that, when achieved, will end extreme poverty by 2015. With five years to go, how close are we to reaching those goals? Concern Worldwide, the international humanitarian organisation, has launched its third annual essay competition, the Cecil Woodham-Smith Writing Competition, for students to write about global issues. The competition, which has three categories - Junior, 12-15 year olds; Senior, 16-18 year olds; and, Adult, 19 year olds and over - invites entrants to submit the speech they would deliver to the 192 Heads of State at the UN in one of the eight Millennium Development Goals: Eradicate Extreme Poverty and Hunger; Achieve Universal Primary Education; Promote Gender Equality and Empower Women; Reduce Child Mortality; Improve Maternal Health; Combat HIV/AIDS, Malaria and Other Diseases; Ensure Environmental Sustainability; and, Develop a Global Partnership for Development. 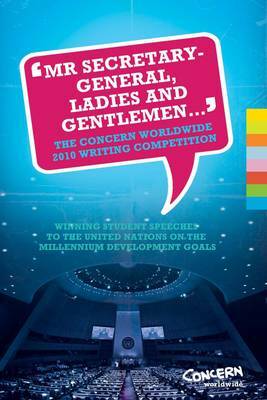 Concern has received over 700 entries in the competition, and an external judging panel will select the best ten in each category, which, along with notable extracts from other submissions, will be published as "Dear Mr Secretary-General". This book will be promoted heavily by The Liffey Press and Concern Worldwide and is certain to receive a great deal of media attention.